Weather Underground on the Weather Channel: Highly gender-normative interactions. The lady sits behind the bar when the men are talking. This week the Weather Channel, mainstay of bored insomniacs and families on vacation in Florida, debuted a new weekday prime-time live show about the weather. Problem is, the show, Weather Underground, is set in what appears to be a 40-year-old storm chaser’s parents’ basement and features highly gender-normative interactions between its slew of male meteorologists and its single female presenter, Sarah Dillingham. Dillingham is working on a master’s degree in atmospheric sciences and appears on-camera during every segment of the two-hour show. * She frequently chimes in with expert analysis worthy of a co-host (and considers herself one in her Twitter profile). Yet she wasn’t credited as such—or mentioned at all—in the Weather Channel’s press release announcing the show’s launch. Host Mike Bettes introduced her as “the brains behind the bar.” For most of the show’s first two episodes, Dillingham stayed behind that bar. She only got to lounge in one of the set’s leather recliners during the 89th minute of the premiere, during a user-chosen segment called “Flirting With Fall.” On Tuesday, Dillingham was left out of a round-table discussion in the show’s final minutes when Bettes asked each of the three meteorologists in-studio what they’d learned from the preceding two hours of weather nerdery. 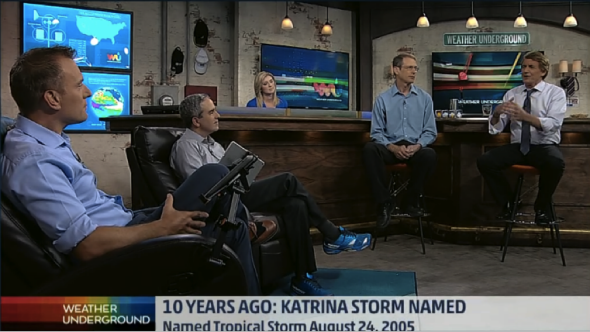 Weather Underground is an attempt to soothe the nerves of potential Weather Channel buyers and amounts to a major re-think of its weekday primetime live coverage. The Weather Channel’s parent, the Weather Company, is owned by private equity firms that may be forced to split up the company’s digital and broadcast divisions if on-air ratings don’t rebound. Clickbait-heavy weather.com is now estimated to be worth more than the television network that launched it. From a business standpoint, the Weather Channel is best summed up as an efficient vehicle to sell prescription drugs to older men. A whopping 73 percent of its primetime viewers this year are over the age of 50. So far in 2015, just 66,000 people in the crucial 18-to-49 demographic watch the network during primetime on average. With Weather Underground, the Weather Channel is betting on hordes of geeks—its original audience back in the ’80s and ’90s, before the network began a misguided experiment in reality programming—to boost viewership. It might work. The network’s other science-heavy offering, Weather Geeks, a Sunday-morning talk show about meteorology, launched last year; it has outpaced the tepid ratings growth of the network as a whole. According to data supplied by the Weather Channel, the audience for Weather Geeks is up 19 percent over the same period last year. A big reason why cable television is struggling is because it has a very low value-to-time ratio. On a whim, I asked Twitter what single word came to mind when people thought of the Weather Channel; among the replies: “repetitive,” “useless,” “advertisements,” “boring,” “lame,” “sensatio(ad break)nalist.” I didn’t see much that reflected hope for the future of wall-to-wall weather coverage on cable TV. Dillingham, however, does give me hope—and I’d feel even more hopeful if the Weather Channel gave her a show of her own, and let some guy tend the bar instead. *Correction, Aug. 26, 2015: This post originally misstated that Sarah Dillingham has a master’s degree in atmospheric sciences. The degree is still in progress.